A while back, Andrew (our Operations Manager) put together this cartoon meant to visually depict our company’s expertise and our product’s versatility. While digitalsignage.NET can be used in a variety of environments, he focused on four- retail, education, hospitality and corporate. Digital signage systems enable retailers of any size to deliver targeted, timely communications to their customers and refresh their messages throughout the day. Incorporating social media feeds and QR codes, retailers can promote their other communications channels (their own websites, Twitter or Flickr accounts), direct viewers to those and influence their behaviour in store. 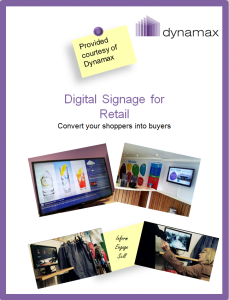 ‘’ excerpt from our white paper ‘’Digital Signage for Retail’’ that we encourage you to download by clicking on the image below. 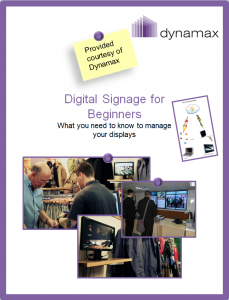 Sign up to digitalsignage.NET for free. ‘’Networks of screens offer you a dynamic, exciting method to communicate with your staff and students. 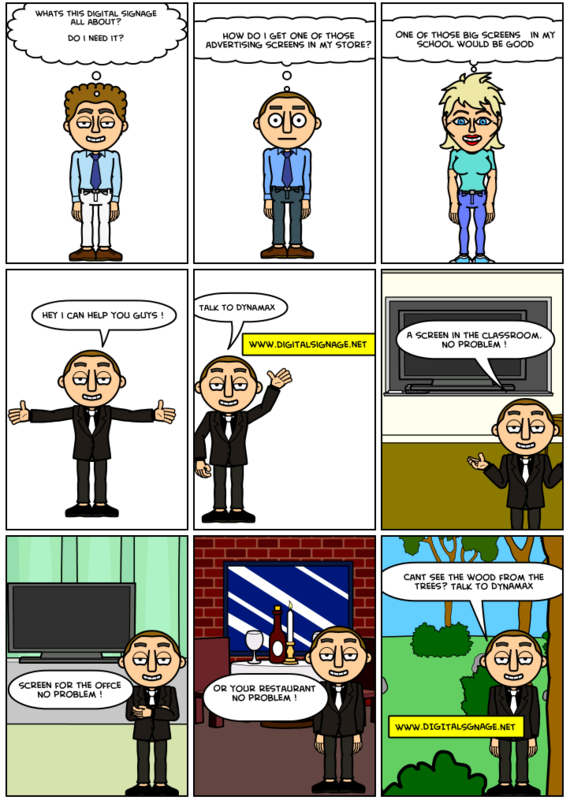 It becomes simple to inform them about events, display messages or exhibit work. Information can be streamed in real time from different websites (Flickr, BBC etc) to display the latest news, photos or live videos. Excerpt from our white paper ‘’Digital Signage for Education’’. To learn more about the technology feel free to download it and/or contact us for a FREE consultation. As Andrew says: ‘’A screen in the classroom? No problem!’’ Give us a call and you’ll chat to him in person. A screen in the office or digital signage in a corporate environment makes it easier for you to disseminate time-critical information to staff at all levels and break down communications barriers caused by distance, lack of devices or connectivity (i.e. no Internet connection or no email access). 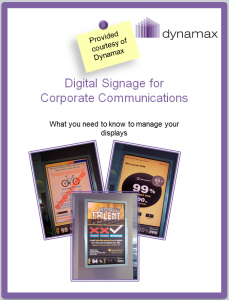 To read more, download our white paper ‘’ Digital Signage for Corporate Communications’’ or request a FREE consultation. Could your restaurant do with digital menu boards to complement printed materials and advertise specialities based on the time of the day rather than just the day of the week? Do you want to be able to promote and update special offers quicker and respond to important events in real time? 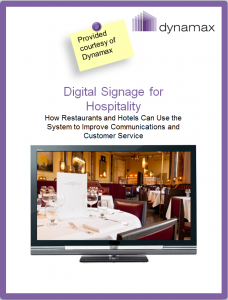 Download ‘’Digital Signage for Hospitality’’ and discover other uses and benefits of the technology for restaurants and hotels. Or get in touch with us, Andrew would happy to answer your questions. Want to see digitalsignage.NET in action? Register for our webinar and run the chance to win a FREE 1-year subscription. This entry was posted in Digital Signage and tagged Chatter, digital signage by Dynamax. Bookmark the permalink.